For your consideration, I present a OOAK artist teddy bear, Bliss, from Esther Pepper of Aerlinn Bears. He has dark brown paw pads, onyx bead eyes, stitched waxed varnished nose. Around his neck is a collar and a ribbon. Huge ooak Tulibear " Mia "
OOAK Tulibear. txzj pxzj27 txzj-11 txzj1 txzj115. This is the sweet "Christopher Robin & Winnie the Pooh" from R. John Wright in 1986. The label is detached from the box and is stained, it looks as if got wet on the bottom. There is a cute sketch of Pooh stuck in a hole and Christopher Robin and all of the other animals trying to pull him out. BEAUTIFUL CHARLIE BEAR NEW MINT CONDITION 14" "Anniversary Ross. 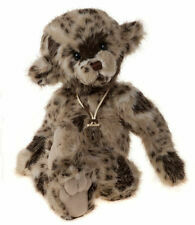 STUNNING HARD TO FIND RARE CHARLIE BEAR WITH BELL COLLAR NEW MINT CONDITION (SEE PHOTOS). 14" CHARLIE BEAR by ISABELLE LEE. WONDERFUL GIFTS AND COLLECTIBLES. This artist collectible little bear is made from plush felt that has been hand dyed. It has black resin eyes and an embroidered mouth and nose. It's arms and legs are jointed. It can sit and stand on it's own. Bill Reid Plush "Haida Bear "
She was a puppy mill rescue, but she is now living the princess life she deserves. I am sorry for rambling. Gramps Bear, jointed, wearing glasses and vest. Separate vest, tie, and shirt. ID in ear reads J.D. 024; 20" tall x 10" wide. Sherlock the Bear, jointed, 18" tall x 9" wide. "I am handmade. Hope you like my tweed! " charlie bear plush retired Connie . Condition is Used. Shipped with USPS Priority Mail.com Great condition and no smoking house. Sneakers are 6 1/2" long. White long sleeve sweatshirt, black jacket and pants. Knotted braids vary in length, some 7". Original embellished Reebok runners, shirt embellished with brass stars and blue beads. Luciebears "Chico" Small Artist Bear OOAK 8"
By Luciebears - Germany. Small Collectible Bear. - 8" (20cm) tall if he is standing. - handmade little Hat. Not suitable for small children! One of a Kind. 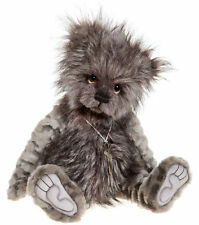 20" Merlin is a fantastic Charlie Bear, made from cuddly, slightly wild, long-pile plush fur in dark slate-grey. He has soft faux suede paw pads and a matching dark grey stitched nose. Merlin's wild fur has been trimmed around his face to show off his very endearing, felt-backed eyes. He is wearing a grey organza ribbon and a hand-made beaded bell necklace. Bear With Pearl Necklace, lace dress, movable legs, 16"
Bear With Pearl Necklace and pink/orange lace dress; legs are movable. 16" tall x 12" wide. This bear was outfitted in Montreal, Canada. "I have a beautiful, hand made dress and hat. This guy is so cute! Raggle has a patchwork of colors that are nothing short of bear-mazingHe is a new 2018 release from Charlie Bears England. 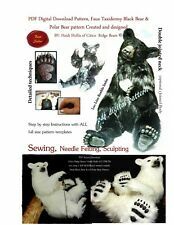 The faces are hand finished to reveal the personality of each bear. Dixie is a plush panda bear designed by Isabelle Lee for the Charlie Bears 2015 Plush Collection. 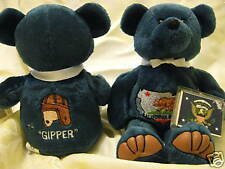 These are pictures of the actual bear you will receive. Robin J. Andreae. Alba was needle felted from a variety of wool fibers with dried rose bud pinned to the base of her hand embroidered shell. She has gold bead eyes. is very adorable and any child would love to hold her, Alba is. 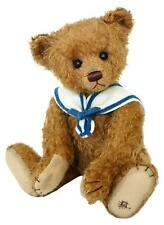 Up for sale is this new Darling from Charlie Bears. She is a wonderfully sized chubby & very cuddly polar bear! She has a coat of soft plush fur in lovely shades of white & very light gray with a matching gray collar adorned with antique bells around her neck. Robin J. Andreae. Little Luna is taking a nap in the garden. Luna's handcrafted fairy wings are permanently affixed. is very adorable and any child would love to hold her, Luna is. As a child I spent many hours drawing all kinds of wildlife on the backs of old brown paper bags. This little chocolate lop ear bunny is ready to hop! Robin J. Andreae. She has deep amber colored German glass eyes and llama hair whiskers. is very adorable and any child would love to hold her, Hershey is. DALTON donkey Charlie Bears 17 inch plush Bearhouse 🐻 Bear machine wash!